Any input on design kitchen. 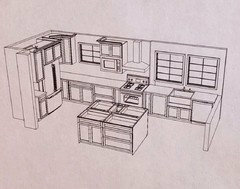 Remodeling original 1964 kitchen, this is our first rendering from out cabinet vendor. Did she do your first design? I am not passing judgement but I am most likely using the same design program as she does. You should always be seeing a more complete design - all walls , floors tile etc in place for you to completely be able to visualize your space. This took me less than an hour to do. If she needs any pointers, I would be glad to help! 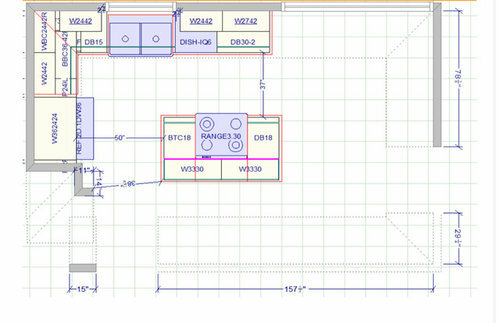 The design program has tons of features, but if know one really shows you how to use them it can be very overwhelming! I don't use half of what is available - I have seen perspectives from designers that look like a photograph! Also - I started with your design leaving the plumbing under the smaller window and it does not leave enough room to center a hood between the 2 windows , do a larger sink and fit a dishwasher there . 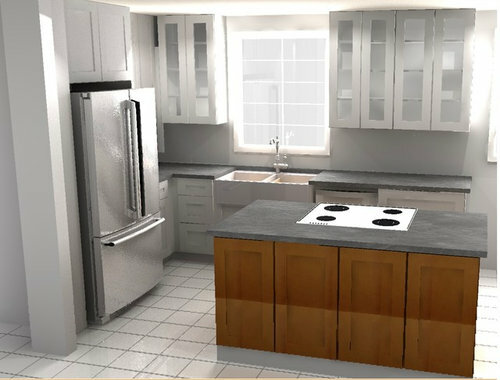 It will look like exactly what it is- an expanded kitchen just adding cabinets without fixing the function of the space. A plumbing relocation is not that ridiculous in the grand scheme of things and when it can produce such a great benefit to the space, it becomes priceless. Debbi's new layout is spot on! Thanks cpartist - that is a great compliment from someone who designed their kitchen and home so beautifully! 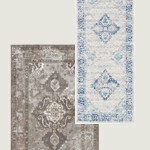 Full disclosure - I just did a design for a customer who is doing almost the exact same thing so I did have a jump start! Here is our 2nd rendering. Cabinet to the left, will be a full size one, no reason to have that little counter there. Also once again thanks Debbie and Beth for making us realize that using the whole wall is the way to go. For me the original layout would be easier to use and has much more storage. Think of how the oven door opening blocks traffic around the island. 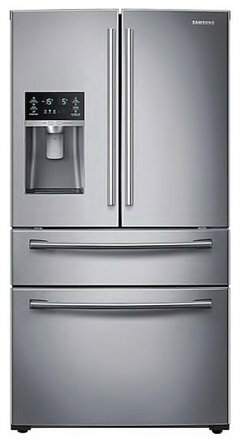 I want the fridge closer to the eating and living area to keep the snacker out from underfoot while I cook dinner. I can't imagine ripping out a whole wall of cabinets, and don't want to see the kitchen sink from the living room. 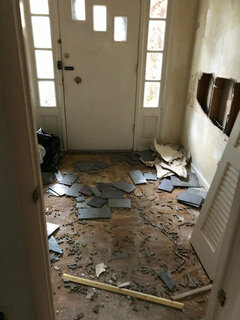 I predict the remodeling rage 20 year from now will be replacing walls in vintage homes.
. Seriously consider how much storage and display space that wall give to both rooms. 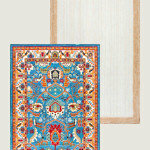 It is not only the function of the kitchen but the flow of traffic throughout the house that wll be altered. I might put the fridge on that wall and create a bevage center. Then i'd add a peninsula where the original fridge was in place of informal dining. Kathleen, how often do people walk around the island w/the oven door open? Let's be realistic here. it's not like they run laps. Nor does anyone leave the oven door open for that long as to impede traffic! as for snackers while you're cooking? set out some cheese and crackers and tell them to stay out while you're cooking. Some of the points you brought up don't happen in everyones home. The way she had it in the orig post was very under-utilized. ac921, the island looks a bit small. I like the larger island better. The corner cabs don't work there. you'll have that small inset countertop that you won't be able to use because the fridge is in the way! forget the cabs above in the corner. do and L shape w/the countertop. maybe some open shelving. or move the fridge over the left and scrap the narrow cabs on the far left. As for the prep sink, with something that small, you might not even need it. think about how you prep lettuce, corn on the cob, or other larger items. if you have a little bar sink like that, it's not going to work well. (also think about plumbing. if you're on a slab they will have to cut the concrete to get the plumbing line over there) I'd pass on the prep sink. I have a similar space between my island and sink and don't need it. I keep a cutting board on the island and do dry prep over there, wet prep near my sink. instead of the microwave where you have it, get one that can be installed in your island. The way you have that single upper cab w/the microwave looks weird. Maybe put it to the left of the fridge. that tiny counter spot prob won't get used much. either set it on the counter there, or above, or in the island. Forgo the cab on the side of vent hood. It's off balance. what you could do is remove that one window and continue w/some upper cabs if you think you need more storage. you also need more drawers, large drawers, around the stove area for pots and pans. I think the layout she did for you looks unbalanced. You don't need symmetry but you do want balance and this isn't it. I don't like how the stove is off center between the windows. Center it and put same sized uppers on either side. Then to make up for the lack of upper cabinets, make all lower cabinets drawers! Drawers are so much more efficient and store a heck of a lot more than cabinets. Instead of the microwave up high, put in a drawer microwave on the island. Trash drawer should also be on the island next to the prep sink. Most trash is generated next to the prep area. Personally I think the two pull outs on either side of the stove are next to useless. 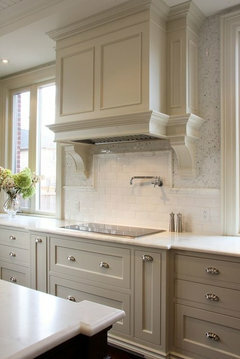 They look good but I'd rather have large drawers and upper cabinets on either side of the hood for oils, spices, etc, like in the version Debbi showed you. Much better. That island is skimpy for such a large space. On the side of the fridge you need 42"-48" between fridge handle and island counter edge and on the other side, you only need 36" between island counter edge and wall. Also putting the prep sink on the edge of the island is also poor because where do you put the foods you take out of the fridge and pantry before you wash them? That's another reason for a larger island and room on the other side. As for prepping, you want at least 36" minimum and that's bare minimum for prepping and personally I wouldn't want anything less than 48". Forget the upper corner cabinet. Instead have the uppers on the fridge wall die into the window wall. Lastly it looks like there are a lot of narrower lower cabinets. Wider is better and again they should all be drawers. Hmmm - I don't care for the microwave sharing that space for the hood..that counter to the left of the ref is useless and pushes the ref too far to the right. Most french door ref. need approx 14" of space to either side for the door to back swing. The plan you have here leaves you about 11" before that door is hitting the countertop. I also agree that the island seems a little out of proportion. Are you not doing seating?? If not then it needs to be redone so you can fit a small table. 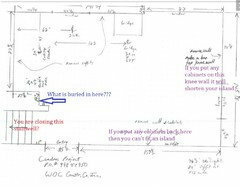 the wall is not load bearing we have had our engineer already verify that. The two pull outs on the side of the stove my wife wants to keep for right now, she likes the idea of the cooking sheets being used there. Prep sink we aren’t to sure about yet if we even want one. Borrowed this picture and it seems fine with distance from sink to fridge. 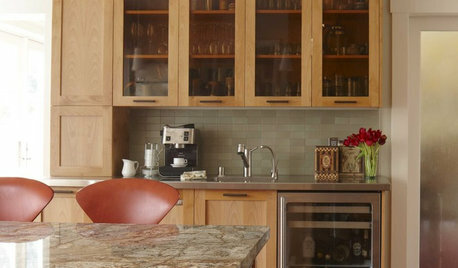 You are lucky ...because you have many options and the space to fulfill your kitchen dreams . What do YOU want/need ? Do you want a counter to sit on ...with a great workspace ? 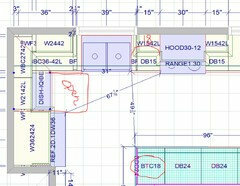 Do you want to divide the kitchen with the kitchen table / breakfast nook ? Do you want it open ? 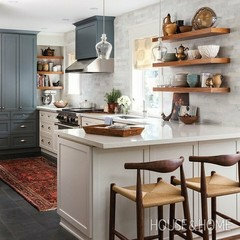 When you know your needs go for one of the many beautiful options available and suggested to you...you always have HOUZZ kitchen section...HAVE FUN! You've gotten some good feedback... below is my take... I probably wouldn't try to squeeze in upper cabinets around the hood/range (tho I'm not 100% on the dimensions between the two windows). - 9" overhang for the island is sort of an awkward depth... not really deep enough for people to tuck up to the island but too deep not to have stools. 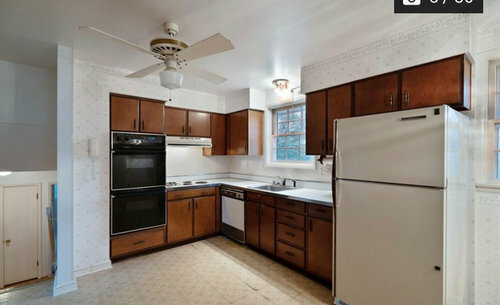 If you have room, I'd try for at least 12"
What are your thoughts on moving the farm sink to the opposite window down by the fridge and having the dishwasher directly behind in the kitchen island? Then the microwave could be in the base cabinet under the far right windows. I just get the feeling the sink will feel so detached from the space being on the far right. 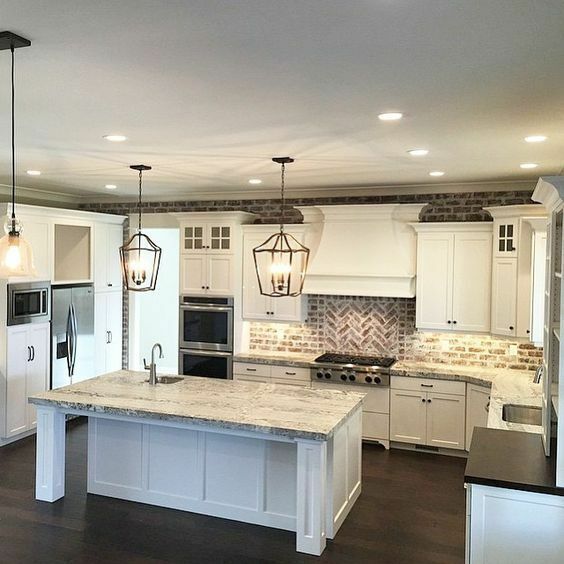 I don't know, I would do a wrap around type of counter where you can place bar stools on, some French doors, and keep a counter height square table, of course you need an island, but I wouldn't take away those other cabinets and counters across the way. 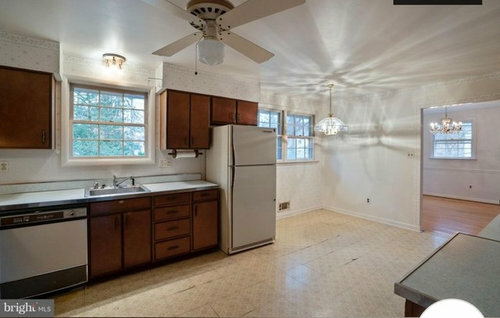 I like the idea of moving the fridge to the other side but then I think a corner sink would then be nice there. I guess the main thing I wanted to say about all your changes is it just seems like although your increasing counter space, your really reducing cabinet space and seating, and in the end this is suppose to be a gathering area, unless you have another formal dining area which will for sure be used for daily dinner, or you will just mostly eat out than just the island is fine, but how much counter space do you want compared to how many things you want on the counters in plain sight, usually as minimal as possible, and I even like the desk spot because it adds another seat where everyone can hang while on the laptop. I mean unless there is another area in the room where everyone is suppose to hang and eat, but usually I like eating to stay contained in the kitchen, unless you are able to spend much time eating outside and that's not eating in front of the tube. I'd rather just keep one sink to clean, but wherever it ends up being able to have view outside is important the option with the split 2 windows is not nice, and also unloading the dishwasher and having to walk all the way across to put it all away is not easy. 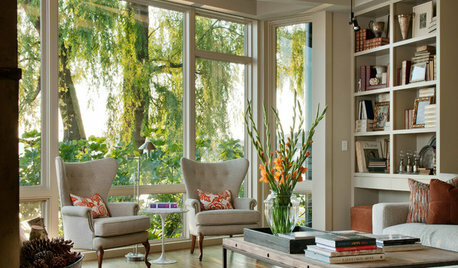 The reason I mentioned French doors is to be able to keep the space active and inviting, like it almost already is. Shoot the more I look at your existing kitchen I don't even think you could have the option to take away anymore cabinetry. Add an island and the peninsula if anything. If you notice the cabinets above your stove, that's for vitamins/ medicines right. Then the cabinet right next to the stove that's your spices. To the left of the sink and above the dishwasher is where you store plates/ bowls and glassware and to the right is the rest of drink ware/ mugs/ cups. Above the oven is flour/ sugar storage ect. and below some storage for some bake ware and next to the fridge some pots and pans. So across the way you have some bottom cabinets for your crockpot, blender storage and such. So you need all the rest for the canned foods/ cereals and all, I don't see how you could sacrifice any cabinetry, right? Or do you have a walk in pantry already? Yes Beth, not everyone's home has teenagers grabbing drinks from the fridge, and loading the dishwasher while a ADHD toddler does try to run laps. But most moms can relate to a busy kitchen. 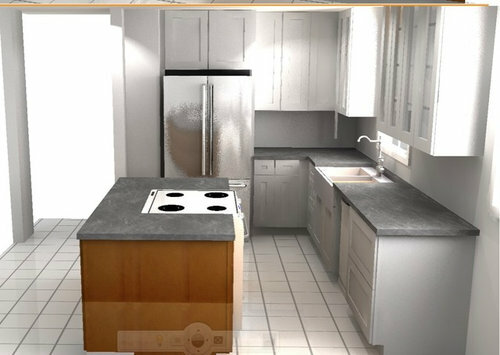 Alex, I would consider how much room you have between the open dishwasher or oven and the island if only for the ease of the person using the oven or dishwasher. 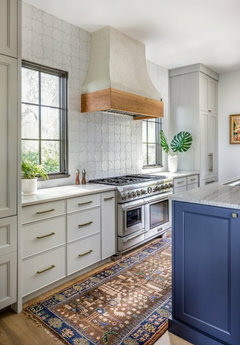 In some of the beautiful pictures posted, it looks like someone would be bumped the opposite counters just to put something in the oven or dishwasher. I see a lot of great ideas but have to say more questions need to be answered....how many cooks, members of the family, types of appliances / cooking style, special storage needs (baking, etc), exterior finish of home (siding vs brick) and most importantly - budget? 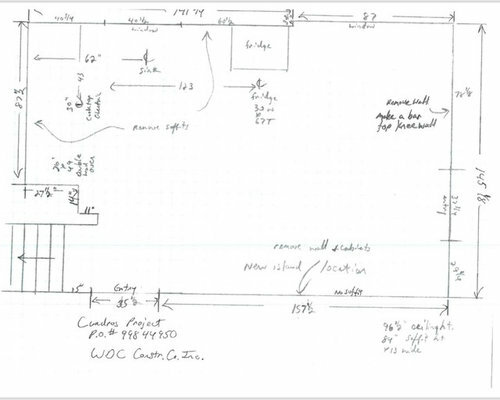 Also, has flooring for the whole open concept area been factored in? Of course a KD would be great...but everything goes back to the budget question. If you want to minimize all of the electrical and plumbing expenses required by moving everything around, I think I’d center a range in that short wall, not a fridge. A range, not a cooktop and wall oven. In fact, I don’t think that I’d change very much about the current layout at all. Swapping the range and fridge doesn’t really help the flow, or make the kitchen better. It just costs you more money. Putting the cooktop on that small island is just a really terrible idea. I honestly don’t see how any KD could create that. Me Ora, we are building a walk in/step in pantry to the left of the fridge. So that’s where a lot of stuff will be. We also have a formal dining room on the other side of the wall that has the two windows on the right side of the kitchen. We are meeting the kitchen designer today at the house, flooring has been considered and will be a herringbone wood or lvp, but whichever it is, will be herringbone. Will post updates once we have a discussion with designer. 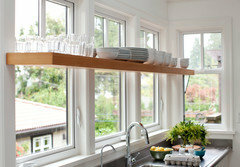 Just one simple thought......do whatever you can to avoid crowding the window in the heart of the kitchen with cabinets. 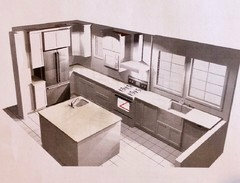 That "stuffed with uppers" look is one of the most dated features present in kitchens of the 50s & 60s. People back then didn't know about lower drawers for storage or all the other storage options we have now. They also had a lot more turkey roasters, bundt pans, glassware for 24 and so on. 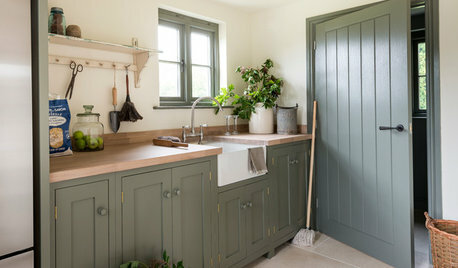 Reducing or eliminating uppers, especially near windows, is one of the best things you can do to make your kitchen feel like a breezy, airy attractive place to be (especialy when open to living areas), and careful planning means you will not miss the storage. Okay, and I really like Kathleens recommendation for a "beverage" center, that would be so nice to have. I mean when you have guests obviously it's here's some water, would you like some wine, how about a beer, want a coke, do you drink tea, but coffee is made! Well yes it's certainly important, I know you were wondering about a spot for the microwave (which does get tons of use, but may be able to be kept in the pantry) having a nice little cafe spot on the countertop is always nice. Best of luck!! I have put cooktops in the island many times. My question is do you have enough space and how are you venting it? 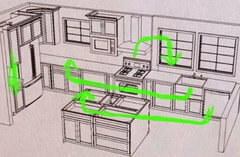 I would see a designer or kitchen designer because they will know more of how a kitchen functions and the proper spacing, etc. I design a lot of my clients kitchens due to the fact I also build and know how venting, electrical, and water needs to run in a kitchen. 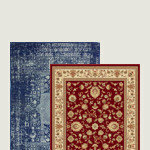 It is worth the money so you do not make costly mistakes. Good luck with your meeting with the designer - I hope you get to a good place in your layout! Regarding your question about having the sink off to the far right - the great thing about having it there, along with the DW, is that someone can be in charge of loading/unloading the DW and they are not in the way of another person(s) who is cooking. It's especially handy if you "clean as you go" during meal prep. Two Babies will turn into toddlers running laps and teenagers bringing the crowd home for snacks. 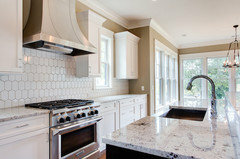 Plan for that future traffic because the kitchen is a great place to be with family and friends. 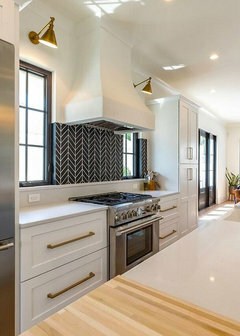 I love the idea of Herringbone flooring especially if it runs through the adjoining rooms. 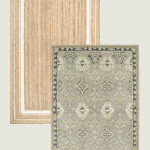 A good KD will help you plan for all the functions and the style. 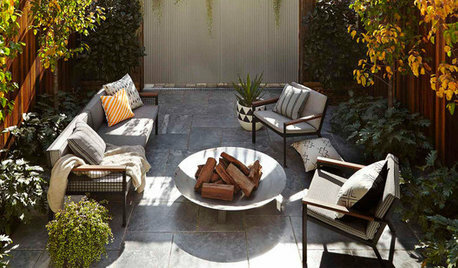 Shared this design dilemma with my husband and he said to remember that vendors and contractors make more money by ripping everything out and moving things around but they don't have to live with the changes. 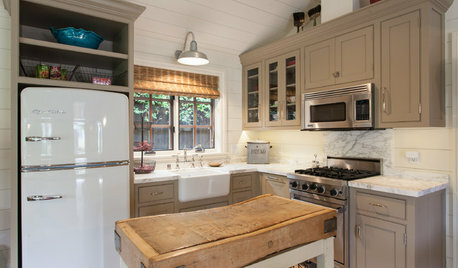 He suggested keeping most appliances in their original location and making upgrades to counters, hardware and flooring. He said the money saved will be needed for braces, school activity fees and college funds. What would happen to the flow of the rest of the house if you kept the wall but switched the opening to the living area so that it opened into the informal eating area? 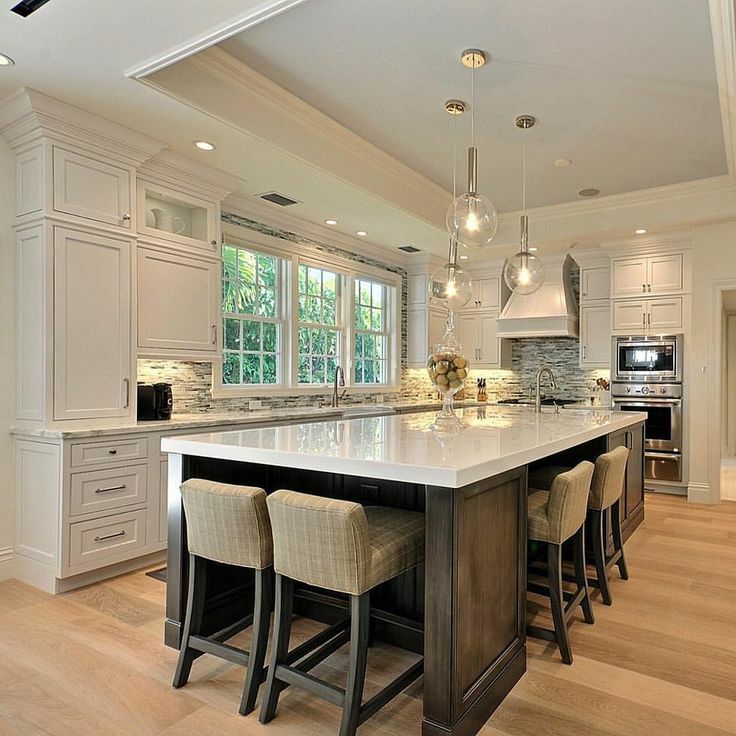 An island or Peninsula perpendicular to the wall could serve both areas when entertaining. 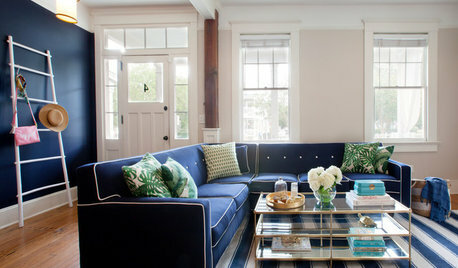 A corner banquette under the windows could add storage and kid friendly seating you won't get with a bar on an island. Debbi Washburn layout still my favorite. When I see your room, I am thinking about smth like this or that. I agree with previous person, that your kids grow up and you will have a lot of teenagers in the house :) So you need some big and comfortable space for all of them. If you are closing the stairway up AND can remove whatever is in that bumped out space of wall then you would have plenty of room to do a pantry, ref, wall oven and still have about 42" into the corner. If you can't pull out whatever is in that bumped space then it is a different story. The space to the left of the double stove is hvac stuff, we poked a hole and confirmed. 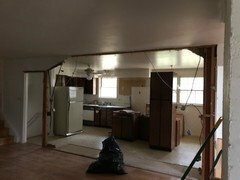 We close this upcoming Monday and demolition starts with the 3 bathrooms and kitchen. KD is going to work on a Debbi like layout, my wife has issues with the sink so far fridge and stove, her words were detached from everything. So we are trying to see different sink options. Dishwasher will be a paneled one, to help break up all the stainless. Stair case will be more a closet pantry. No cabinet on that wall to the far right, that will be bare. Dining room is on other side of it. That staircase will be the closet pantry. And the wall that is being removed is where the kitchen island is going. So only cabinets under the island top. You’re wasting a bunch of money to move things around so much. Just leave the fridge and range where they are. Hi why not bump out the wall between kitchen and dining room? That would solve a lot of problems? Just a warning...don't put a micro in the island. I had one and it was a pain. You had to kneel down to see the controls. And just imagine how much fun 2 toddlers would have pushing the "open" button which will be at their eye level! Maybe a drawer but pricey to replace. I'd try to find a better spot. 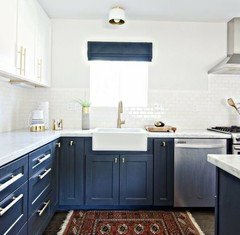 But I did love having a small prep sink in the large island with a trash pull out next to it. But a micro under the counter -- NO. Initially it may seem like it is REALLLLLLLy far to move around the kitchen, but once you are in there and entertaining and do a larger meal that space is priceless. Personally, I would keep your original layout. So this is whats Happening so far. The far side by the microwave will be a beverage/coffee setup area. Also in regard to the Dishwasher. To answer Alexis first. Dishwasher opens. It’s about 4” in front of the massive SB39. So technically you can still stand at the middle of the cabinet. Trash can is behind you on the island, closest to the fridge/sink. On the measurements, it’s a rough idea. The 7/16 and 3/16 will probably end up being ½ and ¼ respectively. To give you a rough idea (though not to scale) each of the green squares is 1 foot. Maybe there is an inch or so that can be stolen from that pipe chase - sometimes you can reframe that from 2x4 to even a 1x3 flat. Those things are often built larger than they need to be. If you don't want to bring the sink to the other window then please consider putting it in the island. Keep posting - we're following! 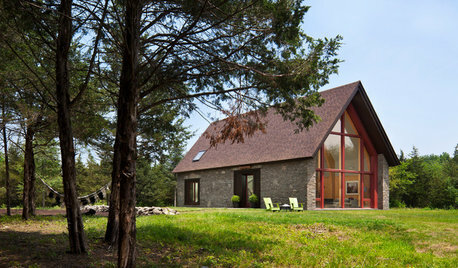 @Debbi, after showing the wife, we are leaning towards your rendering. Just seems to for better, and the distance from the sink to fridge is doable. Might install a prep sink somewhere in between, but not sure. In your layout, where do we put glassware? Are drawers ever used for glassware, this is our first time going with drawers. I am a bit old school - I still feel that glassware and coffee mugs should be in wall cabinets. All other things can fit in drawers. You should have plenty of room for both. I know alot of people tell you to put drawers everywhere. And thats great but it can also take a chunk out of your budget. And they are not good if you need food storage. You are building in a closet in that stairwell area so that will be your great storage space - be smart about it - do the right shelving - something that is adjustable so you can customize it to your needs. It is a deep space so that really isnt the place for canned goods or things like that. That is why in the original plan I had a shallow pantry "standing in front of that pipe chase wall. Those are great for that type of storage - you need to be creative with your space and not just put in cabinets because they balance. 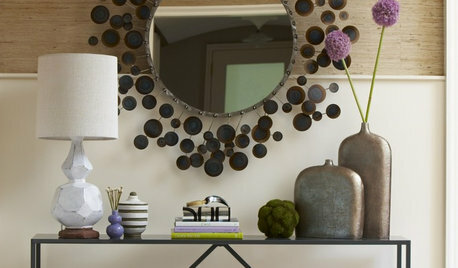 You have a great space - you can spread your wings and have a lot of things! I'm glad to see you're coming around to Debbi's plan - the latest version just seems to squished having everything in the original footprint but counters & cabs extending into the surrounding space. I'm definitely pro-drawers for all dish items =) and like I tried to annotate in the plan I posted above (which is basically just a rehash of Debbi's lol) is you could use the bank of drawers in the island opposite the DW for your dishes - means they're low enough for your kid(s) to access as they get old enough to do things on their own. I love a shelf across the window! If those uppers with glass are for your dishes, don’t do two doors per cabinet. One door gives easier access to everything for taking out or putting away. Two doors to open and two doors to close is less convenient than one door. I did two doors and regret it. We are waiting on her designs to see what’s up with the new ones. 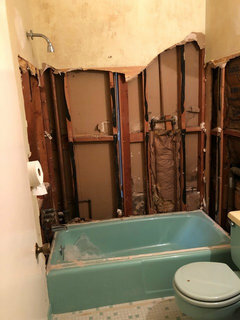 We started demo, the wife and I took the day off and accomplished this with some friends. We have a next Day dumpster parked out front. 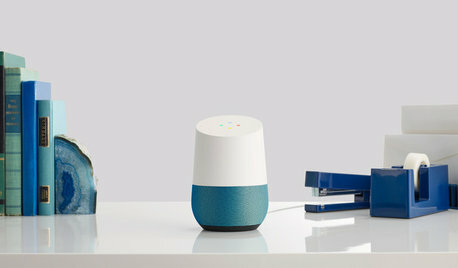 Because who wants to look at a clunky gizmo every day? I would very much appreciate input on the layout and design ideas for my great room. Any creative input on how to decorate this room?